The purchase of illicit antiquities by North American museums has received a lot of media attention recently, and deservingly so. An internal report by the Getty Museum in Los Angeles concluded that 350 ancient artefacts were purchased from dealers currently suspected of looting. This includes a third of the ‘masterpieces’ that form the core of the museum’s collections. I’m not aware of similar reviews of other such collections, but the situtation is in many cases probably not radically different. Boston’s Museum of Fine Arts followed an extremely aggressive acquisition policy right up to recently. 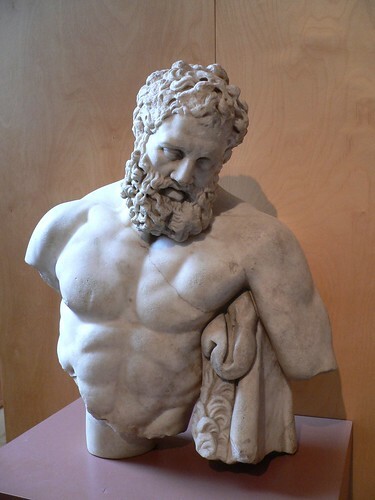 A well-known and somewhat symbolic case is this statue of Hercules, that almost certainly was looted from Perge. One half was taken out of the country and entered the antiquities market. It ended up in Boston, jointly owned by the MFA and notorious collectors Shelby White and Leon Levy. The other half is in the Antalya Museum. Unsurprisingly, the MFA makes no mention of the fact that the statue’s lower half is in Turkey, whereas the Antalya Museum, of course, does everything possible to make visitors aware of the missing half and its whereabouts. Upper half of statue of Hercules from Perge, Museum of Fine Arts, Boston. Photo: TMK, January 2006. 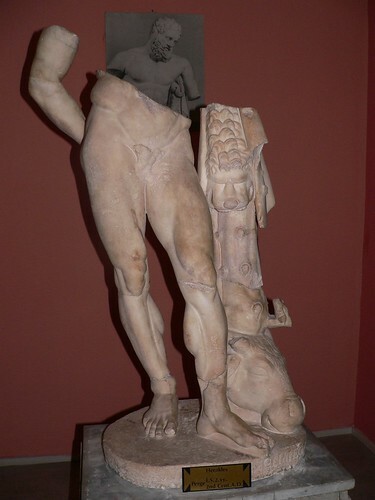 Lower half of statue of Hercules from Perge, Antalya Museum. Photo: TMK, May 2006. Danish museums unfortunately share many of the attitudes towards illicit antiquities put forward by their American counterparts. See for example the extensive coverage (in Danish only, sorry) by Information on some of the controversial pieces in Danish collections. Things have been rather quiet after these articles were published, even though several politicians have pleaded to intervene. Neil Brodie & Colin Renfrew. 2005. “Looting and the World’s Archaeological Heritage: The Inadequate Response”, Annual Review of Anthropology 34: 343-361. Neil Brodie, Jennifer Doole & Colin Renfrew (eds.) 2001. Trade in Illicit Antiquities: The Destruction of the World’s Archaeological Heritage. Cambridge: MacDonald Institute for Archaeology. Colin Renfrew. 2000. Loot, Legitimacy and Ownership. London: Duckworth. On-going coverage from Elginism, Mediterranean Archaeology and PhDiva.